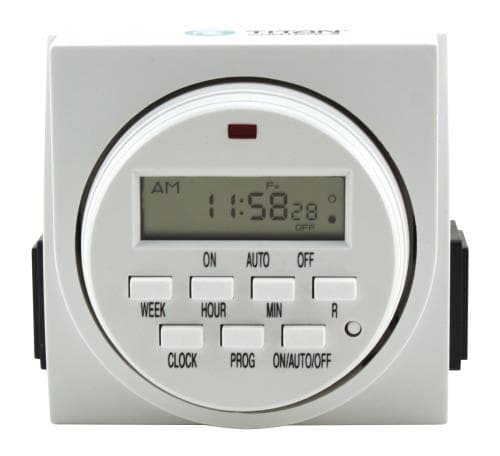 The Apollo® 9 – 24 hour digital timer is the perfect timing solution for your hydro systems. With two outlets and a 15 Amp capacity, it’s easy to set to run your pumps, fans, etc. 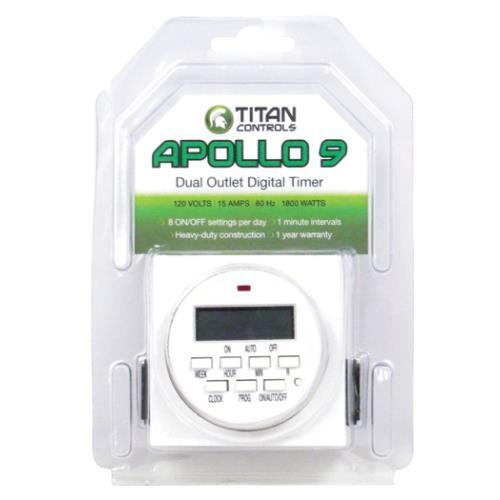 The Apollo® 9 may be set to 1 minute intervals and run 8 separate schedules per day. It can be configured in numerous timing schedules to meet the most demanding timing requirements. Two (2) outlets with 1 minute intervals. Battery back-up feature saves settings if power goes out. Heavy duty construction with enclosure resists dust, rust and moisture. Not for use with digital ballasts. 15 Amps maximum/120 Volts/60 Hz. HINT: If not functioning properly, plug in for 5 minutes and press the reset button. This generally fixes any problem.